Do you want to make amazing, light and fluffy rice every time? Well it’s possible, with my easy rice cooking technique. 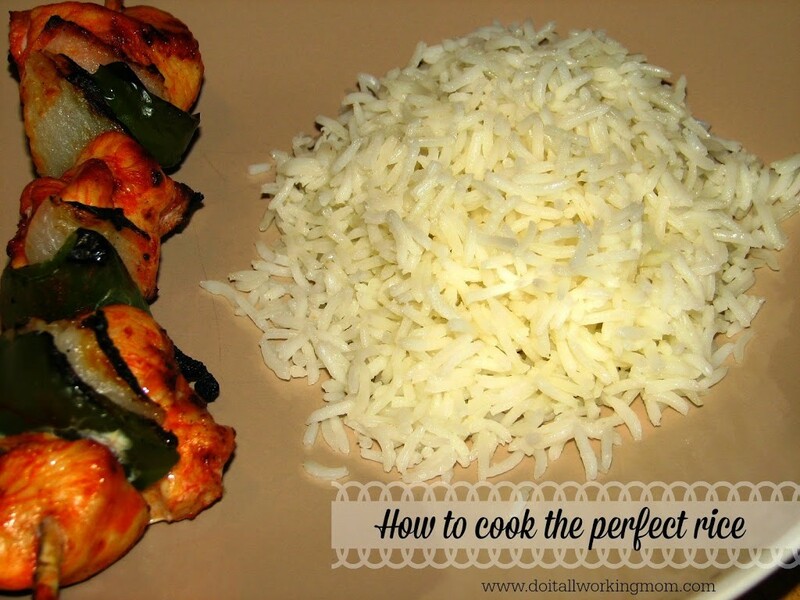 To make this recipe, I use long grain or basmati rice and it works every time! 1- Rince the rice under cold water until the water is clear. Drain. 2- In a sauce pan, bring to a boil 2 1/2 cups of water. 3- Add 1 1/2 cup of rice, 1 teaspoon of salt and 1 tablespoon of olive oil and cover. 4- Reduce heat almost to minimum (I set it at 2) and let it boil for 20 minutes. 5- Remove cover and continue to cook for 5 minutes. 6- Put the cover back on and let the rice rest for 15 minutes. 7- Before serving, fluff the rice with a fork to separate the grains. If your are having people over or you just want to make more rice to have leftovers, here is another recipe with larger quantities. Follow the same instructions but at step 6, let the rice rest for 30 minutes instead of 15. And that’s it! From now on, your rice will be perfect every time. My boys love what they say, “white rice” with anything and everything. I always cook Jasmine rice – I like it’s complexity and it’s a bit chewy and fragrant. The perfect rice to add a pat of butter and a little salt;) It cooks up perfectly every.single.time! Except white rice has no worthy nutritional content. So we’ve been exploring and enjoying Forbidden Rice – a black rice, that is rich in antioxidants, minerals and vitamins and it cooks up to be a beautiful dark purple and the boys really like it too! Great post! Thanks, I’ll have to try Forbidden Rice sounds really good. I always had a hard time getting rice perfect on the stovetop, especially when we had a gas stove, so I bought an electric pressure cooker to use as a rice cooker and many other things. If I don’t have that nearby I’ll give your method a shot! Great read, I always have a hard time when cooking it from scratch, especially with wild rice. Interesting. Never thought of this. I rarely every cook rice and often times it is not perfect. My kids love rice, they would eat it every day! Even though I try hard, it doesn’t always work the way I want it to sometimes. Will try your way! Thanks! Try this method and you will never buy the bag rice again. I have a rice cooker and my rice never turns out very good. I will have to try this next time. Thank you for sharing! Never evern tried a rice cooker. No need, with this cooking method. I like that you mentioned rinsing the rice first- it makes so much difference and most people don’t know to do that. I’ll have to experiment with this technique using brown rice. I’ve never tried it with brown rice, let me know if it works! I’ve rarely managed to cook rice perfectly – it’s surprisingly easy to either burn it or boil it into mush. But I’m guessing that rinsing it first must be a pretty necessary step.